New to longboarding? Need to know what longboard deck, trucks, wheels, and bearings to get for your riding style? Choose your riding style below and find your perfect longboard setup. Longboarding as a means of transportation. Great start for beginners. Longboarding on hills while doing technical maneuvers. Intermediate to advanced. Longboarding at high speeds, requiring a lot of precision. Advanced only. Keep checking this page out for updates. 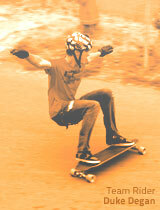 Why should I spend time reading a guide for longboarding? Isn’t it just a long skateboard with soft wheels? When you’re dealing with moving parts, in any situation, it’s always important to have quality equipment to make sure you stay safe. And when it comes to maximizing the functionality of a longboard, all components should be taken into consideration. There are many components that can improve your longboarding experience, and nearly as many others that can ruin it for you. We have put this guide together to help you get the maximum amount of fun on your first go-around with longboarding, so that (hopefully) you will become as passionate about the sport as we are. How much of the guide should I read? Only what you want to read! Feel free to read as much or as little as you need. If you want help finding the best cruising longboard for your riding experience, read the whole Cruising & Carving Guide. Or you can just read a particular section, such as one highlighting how to choose the right wheels for your cruising longboard. Use the links on the left to jump to the specific point of the guide you’d like to read. Whatever you need help with, whether it’s building a longboard from scratch or getting help on one part in particular, the guides are here to help you. If you don't know where to begin, the Guide to Cruising & Carving is the best place to start. It's the mellowest type of longboarding that most people love.